Walking into Ben Brown Fine Arts has been quite the experience of late. We were greeted by two air hostesses clad in 1970s-style uniforms, who led us into a colour-coordinated Narnia-style set; quite a world away from the clean, white-washed cube the Mayfair space usually exists as. 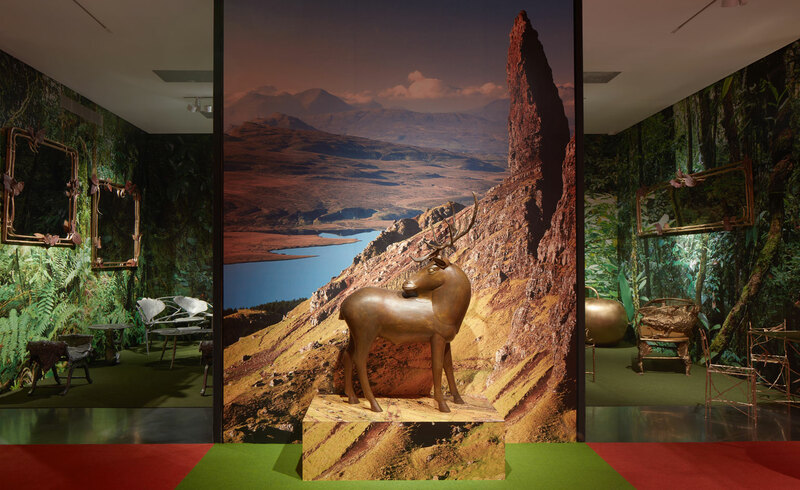 The showcase was of Claude and François-Xavier Lalanne’s fantastical sculptures, hosted in a weird yet wonderful set created by Italian interior designer Manfredi della Gherardesca. 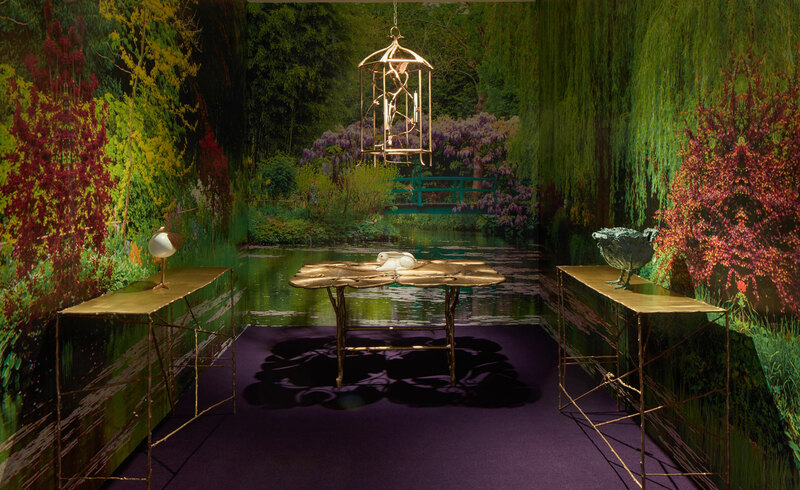 Those who know Les Lalanne’s works are already aware of their chimerical qualities. Claude creates outlandish flora and fauna – oversized apples, cauliflowers and gold leaf chairs; while the late François-Xavier realised gold rabbits, gorillas and life-like sheep. But this is certainly the first time the avant garde sculptures have been featured against such a surreal backdrop. ‘Think 1970s world travel; airports and travel agents meets dioramas in the natural history museum,’ Gherardesca explains to Wallpaper* of the set-up. We realised then that the pair of retro stewardesses were acting out a metaphorical flight, heading to the enchanting travel destination images in the different backdrops: the Amazon rainforest, a Middle Eastern desert and the Scottish Highlands, all of which give Les Lalanne’s sculptural archive a new dialogue. The effect is cinematic. In the most imposing and effective corner of the space, a herd of François-Xavier’s Moutons de Laine sheep appear to march towards the viewer from a glowing red desert, while the opposite wall shows a giant rabbit – Nouveau Lapin De Victoire (Grand) – popping out of blue snow-capped mountains. Elsewhere, Gherardesca honed in on the Mother Nature quality of Claude’s work; the iconic gold apples and leafy tables are situated in the Amazon, complete with water features offsetting the scorching green forest on the walls. ‘The rural quality of the Lalannes’ work marries itself very naturally to these exotic landscapes,’ states Gherardesca.